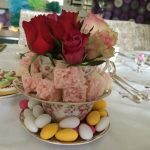 These will give you an idea of some of our events, we will work with you to create a tea party however large or small, to suit the occasion and your budget. selection of our silly hats for £10 and make it a madhatter’s tea party. A recent example, a client asked us to set up tea/coffee, a small array of sandwiches and cake as a buffet service for twenty friends and family when they returned to the house. We provided china, served food and drinks and washed-up. This worked out at £6 per head. A local book club of nine, asked us to provide an afternoon tea service and to stay, serve and clear away. 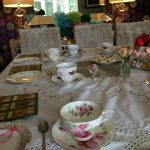 The ladies enjoyed a leisurely Vintage Afternoon Tea without having to prepare the food and then wash and tidy up. They requested the standard tea and paid an extra £25 for waitress service. A party of six enjoyed the standard Vintage Afternoon Tea plus three vintage teapots of cocktails: G&Tea, Long Island Iced Tea & French Mar-tea-ni at £15 per pot. 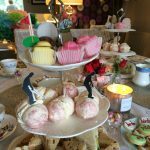 Sixteen lady golfers celebrated one of their groups birthday with Vintage Afternoon Tea, waitress service and personalised golfing touches of golfing napkins, golf cake toppers, golf ball iced biscuits, personalised mini bunting cake topper and flowers in teacups – howzat for a great Tee Time! £21 per head. A group of children, their teddy bears and their parents, met us in a park and enjoyed sandwiches, cake, iced gems, and fruit skewers. We provided the rugs and vintage china was substituted for paper plates, the children drank squash and the adults enjoyed tea from our portable urn. £6 per head. A red, white and blue patriotic extravaganza, we supplied the standard Vintage Afternoon Tea and served jelly and ice-cream in teacups complete with mini Union Flags. 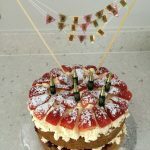 A fresh cream and strawberry sponge cake with mini flag bunting made a centre piece and G&Ts were poured from teapots and the guests dressed in red, white and blue. £20 per head. Whether you are planning a wedding with a marquee on the lawn with mis-matched china for the hog roast and wedding cake or a deliciously pretty hen party with cocktails, fairy cakes and tea cups filled with Long Island Iced Tea – the choices are endless. 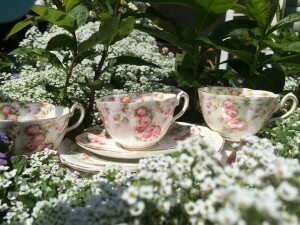 A table of vintage china has so much quintessential charm and style, whether you add jam jars of rustic, country garden flowers or elegant sophisticated floral arrangements the choices are many and we can assist with the set up and decoration if required, or leave you to enjoy the preparations. Please contact us for a completely no obligation chat about any size of event you are hosting, we will be happy to discuss ideas and quotes with you.